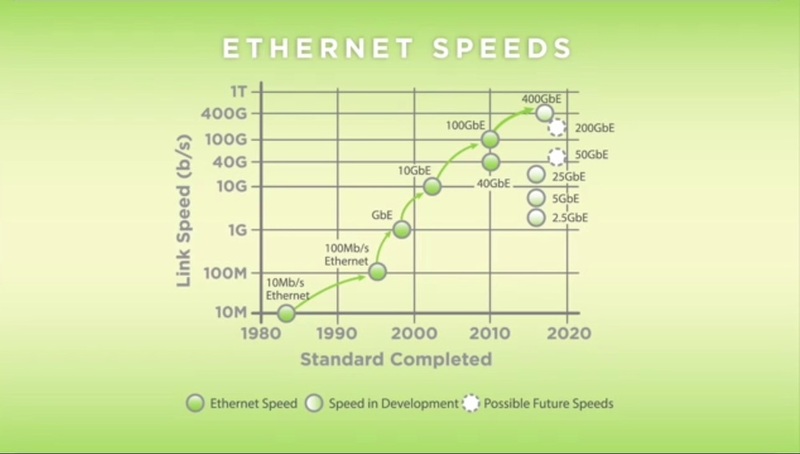 The unbridled growth of Internet of Things (IOT), hyperscale data centers, cloud computing, automotive, and Power over Ethernet (PoE) among others requires Ethernet and BASE-T Ethernet solutions that are cost-effective, power-efficient and operate at a variety of speeds. The IEEE released a series of four new standards that will address a variety of needs including the needs of the harsh environments of industrial control systems requirements for manufacturers and automotive industries as well as the energy efficient Ethernet (EEE) for data center applications. IEEE 802.3bp: IEEE specification for 1 Gb/s Operation over a Single Twisted Pair Copper Cable and optional auto-negotiation and Energy Efficient Ethernet (EEE) and also parameters for full-duplex 1 Gb/s Ethernet operating in harsh environments found in automotive and industrial applications. IEEE 802.3bq: Defines the foundation for 25 Gbps and 40 Gbps twisted pair solutions with auto-negotiation capabilities and Energy Efficient Ethernet (EEE) support for data center applications. IEEE 802.3bq: focused on data center applications defines parameters for 25 Gb/s and 40 Gb/s Operation (25GBASE-T and 40GBASE-T), over twisted pairs with auto-negotiation and EEE. IEEE 802.3br: IEEE 802.3br specifies a pre-emption methodology for time-sensitive traffic. For industrial control system manufacturers and the automotive market. Similarly we see standards being defined or evolving for communication to address the rapidly changing needs for massive growth in IOT, hyper-scale data centers, enterprises, and cloud computing industries. Newer PostOpen Source Era: What makes OpenStack Valuable?